The 31st Tokyo International Film Festival (TIFF) is just around the corner! We are pleased to announce that two Japanese films, Another World and Just Only Love have been selected for the 31st TIFF Competition Section. This year, a total of 1,829 titles from 109 countries and regions were submitted to TIFF. A total of 16 films were selected for the Competition lineup. The full lineup will be announced at the press conference on September 25 (Tue), 2018. TIFF will be held October 25 (Thu) – November 3 (Sat). Junji Sakamoto’s script for Another World is superb. Focusing on the friendship between three old friends, this original story also humanely depicts the life-affirming drama of a married couple. The main character has trouble dealing with family matters, but there is sublime realism in his approach to the business he inherited from his father. The protagonist is played by Goro Inagaki with exceptional naturalism, and Chizuru Ikewaki is equally extraordinary in the role of his wife. Rikiya Imaizumi, who has built a career making ensemble romantic dramadies, now adapts Just Only Love from the novel by Mitsuyo Kakuta. Although the game of love forms the foundation of his film, as the main character’s obsessive behavior toward her boyfriend, Just Only Love defies expectations. Imaizumi’s filmmaking has been enriched with the new perspective of a female author. Yukino Kishii, who is full of coquettish charm as the protagonist, and Ryo Narita, who is brimming with lively persuasive power, deserve special attention. Both these films represent inspired Japanese filmmaking. Koh, who has aimlessly taken over his father’s job as a charcoal maker, rarely thinks about his wife, Hatsuno and his only son Akira, using work as an excuse. One day, Koh is surprised to see Eisuke, his old school friend and former member of the Self-Defense Forces, who has suddenly returned home after many years. By reencountering Eisuke and speaking with Mitsuhiko, another of his old friend, Koh starts to realize how little he has valued his family. When Koh learns about Eisuke’s past, he finally decides to face his work, family and his own life. 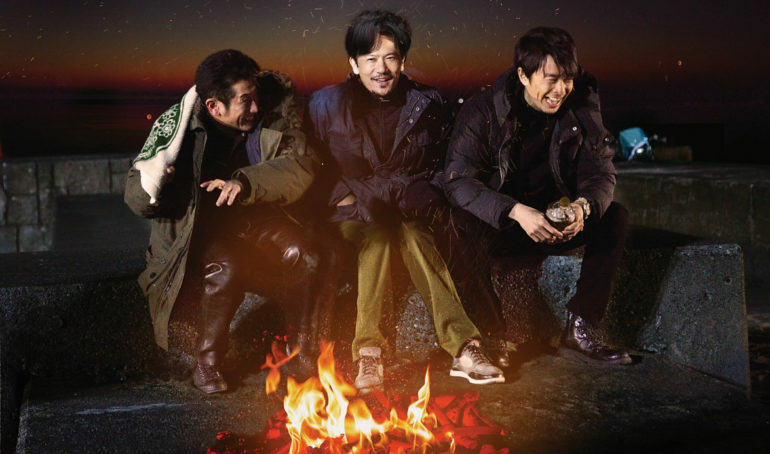 Internationally recognized director Junji Sakamoto teams up with Goro Inagaki to deliver an original story about three old school friends who are about to turn 40 years old. One of them returns home after a long silence and it brings the other two a moment to contemplate the days ahead in their lives. Through the perspective of men who are facing their 40s, a point in life too late to be ambitious but too soon to give up, Sakamoto depicts a human drama of new hope, bonds between friends and family, and struggle of how to live the rest of your life when you reach the half-way point. The film will be released by Kino Films in February, 2019 (Japan). Another World is a story adapted from two different plots that I had been working on for a while. It blandly depicts the background and the families of three old classmates who are in provincial town. Globalism has been exclaimed for a long time now, but the unification of the world is just only for economy. The conflicts also happen because of the distortion of economy. Ordinary things such as having daily meals, leaving offspring are also the part of the world. The thought of it motivated myself to make this film. And during the process, I again realized that filmmaking is not a way to find where I belong, but it is a way to find others’ place in myself. To unknown land with a New Map in our hand, please enjoy our new journey. 28-year-old Teruko got crash on Mamoru five months ago. Since then she has been devoting her life to him. The phone call from him is her first priority even during the work or in the midnight. She is happy, just to be with him. Despite her devotion, Mamoru is treating her like a doormat. One day, Teruko sleeps over at Mamoru’s house and it makes their relationship closer. Teruko gets too excited and start taking care of Mamoru however what she does makes Mamoru leave her. Three months later, Mamoru calls her up and she finds him with a lady, Sumire. The original novel “Just Only Love”, by Mitsuyo Kakuta, is the source for this work by director Rikiya Imaizumi a master of romantic flms. Teruko, a 28-year-old working woman, is smitten by Mamoru, and devoting her life to him. It is a one-sided love affair, with Mamoru feeling nothing for her. Teruko’s love is completely blind, but finally she makes one unexpected decision. This film thoroughly examines the comical and heart-rending nature of one-sided love. The film will be released by Elephant House in April, 2019 (Japan). I see many people who are deeply in love but hiding their feeling. They try to keep the relationship as it is, hoping not to damage it by disclosing their emotions. Teruko insists on staying with Mamoru yet she’s running away from the word “love.” Some may see her as a stalker, but I doubt that any love can exist without driving people crazy. Can we even call that “love”? I directed this film feeling jealousy about characters who are madly in love, and it made me sensitive about the nature of their “love.” I hope everyone will enjoy this film. The full lineup of the competition section will be announced at the press conference on September 25.